For the most current resources, instructions on this project go to the repo! Likewise, detecting certain objects can escalate to sending a text message while recording an image. Here, a dog's mobility and curiosity facilitate information gathering from a different vantage. This is still a weakness of home security systems reliant on stationary cameras. 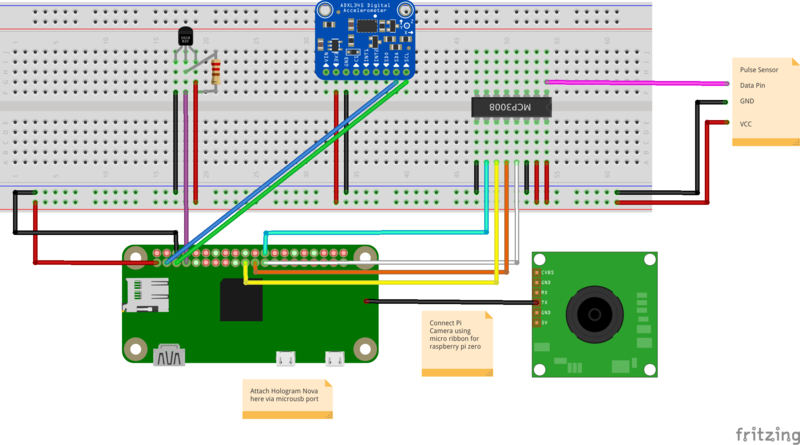 To wire all of the sensors to the raspberry pi, please follow the wiring diagram in the schematic section below. We wired all these sensors to a small pcb board for more reliable connections while the vest is worn. You should connect the Hologram Nova via a usb port (for the zero we used a microusb to usb converter). You should also connect the pi camera using the mini camera ribbon. When a person has been detected, you will receive a SMS message to the phone you configured in your Hologram Dashboard. To see the video recorded when a person has been detected, navigate to http://<you-raspberrypi-ip> and the video file will be available for you to download. If you navigate to http://<you-raspberrypi-ip>:8925 , you'll be able to get a dictionary with the readings from the sensors as well as GPS location of the vest. If you're having issues with the Yolo object recognitition script (picam.py) not finding the camera, it could be that you need to reenable the camera again. Try enabling it again using sudo raspi-config and run sudo modprobe bcm2835-v4l2 .